Quimper (France) (AFP) - UAE Emirates leader Dan Martin, one of a noticeably bigger field of contenders for a Tour de France podium finish this year, says conserving energy and avoiding accidents at the cost of lost time over the first nine days is a calculated risk he is willing to run. Martin has developed as a climber and joined the UAE team from Quick Step this season after spurning interest from Sky and BMC in order to be a team leader. 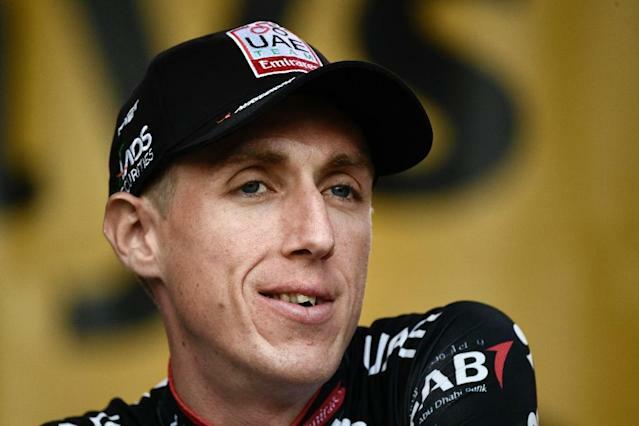 He is the nephew of the great Irish champion Stephen Roche who won the Tour de France, the Giro d'Italia and the world championships in 1987, and Martin, now 31, is going for a first Tour win after placing sixth last year. "If you want to have the legs in the last week you need to take a few risks and let other people get ahead," Martin explained at his team bus Tuesday. "I'm trying to avoid all the crashes (in the fight to keep in the front group) and it's a calculated risk. "It's a long race and I'll need my team later in the race so you won't see me riding into the wind all day like some of the guys in the other teams," he said. "We want to get to the rest day with everybody safe and sound, I'm going to need the guys in the last week. "So to be only 40sec behind guys like (race favourites) Chris Froome and Richie Porte is actually better than I had expected." Martin said that stage six at the Mur de Bretagne "used to be the kind of stage I could win, but I'm no longer sure, as the years go by". The climber came to life when asked about the cobbles from Arras to Roubaix. "It's brutal," he said. "It's going to be one of those days where ahead of it people will be dreading the whole thing. There'll be a hell of a lot of nervous tension. "But afterwards they'll be thinking 'Wow, what a day'. "After first doing it in 2015 I have a whole lot of respect for those guys who do Paris-Roubaix." Martin said there was a time when he had more freedom to attack and has a late break Tour de France stage win to his name. But other teams are more wary of him now. "There are a hell of a lot of guys racing for the Tour win," he said. "I don't get a lot of leeway on attacks even when I'm a couple of minutes down, so it's something that I have learned - not to persist when attacking."